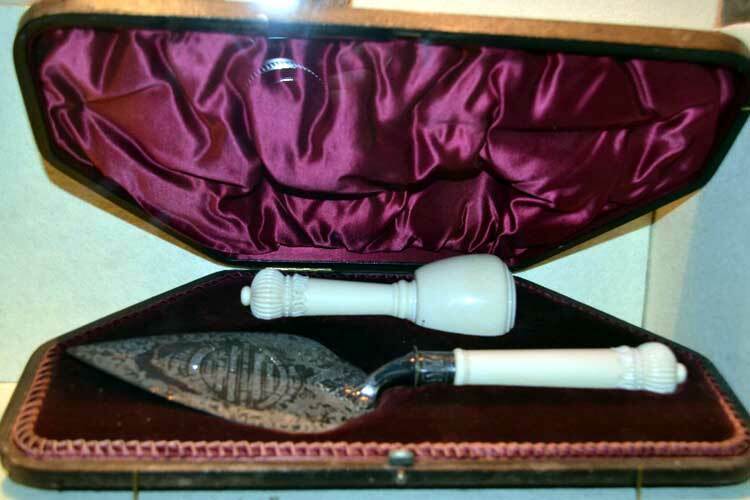 The trowel and mallet were presented to the Mayor of Huddersfield Owen Balmforth in 1908 on laying the foundation stone of the Hillhouse Elementary School. The Victorian School room in Tolson Museum has desks with lids and inkwells. Two pupils sit together in most of these desks and the desks are in rows. At the front of the classroom is a blackboard with chalks and over the door hangs the teachers gown and his cane. 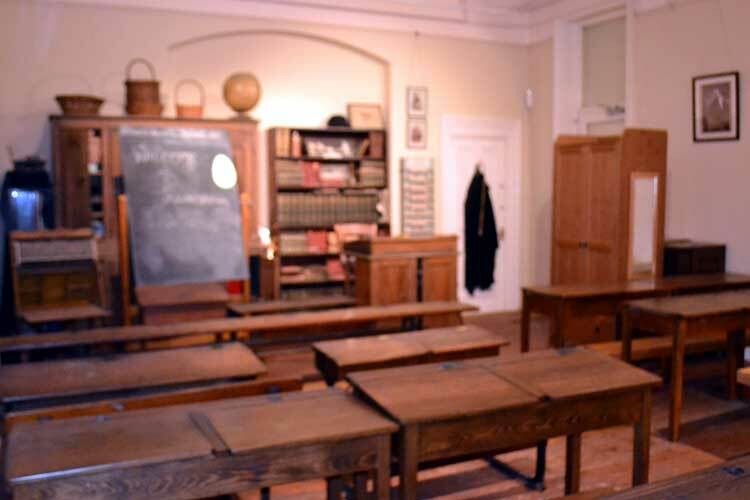 Though this is a Victorian room, classrooms looked very much like this until well into the 1950s. Teasels are plants growing wide in this are in the hedgerows. They have egg shaped prickly heads. The stalks with the heads were collected and dried. They were fastened to handles which were drawn across the cloth to raise the nap. This process could alternate with Cropping. 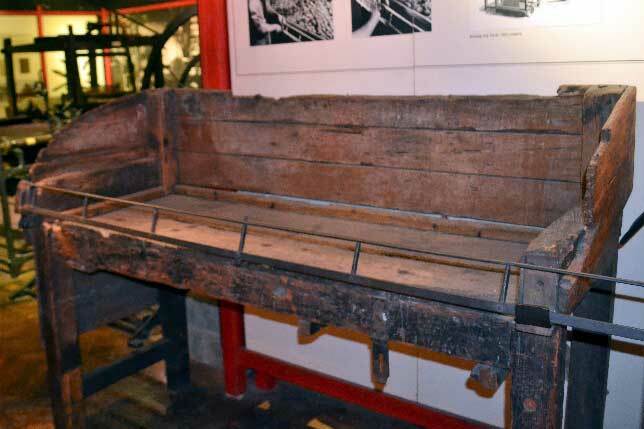 They could also, as in this case, be put in a trough and the cloth was drawn across them. Getting the cloth to market was dependent on horse power. The horse had to be looked after and it had to have the correct saddle. The cloth was heavy and the saddle was padded. 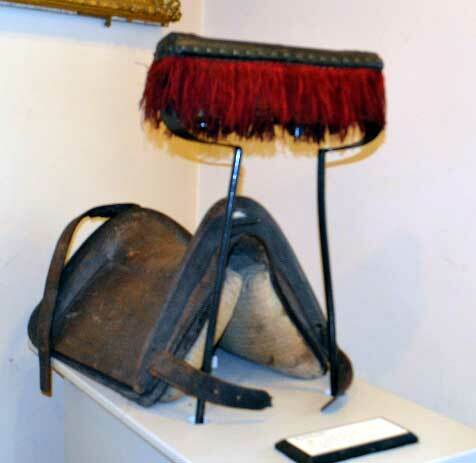 Gangs of horses could be used to transport cloth and in this case the leading horse or galloway would have bells attached to the saddle. 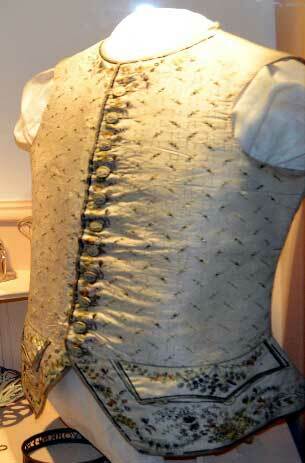 This waistcoat is skilfully made on beautiful fabric. It has embroided pochets and fancy buttons. Surely worn by a dandy! Probably made about 1770. 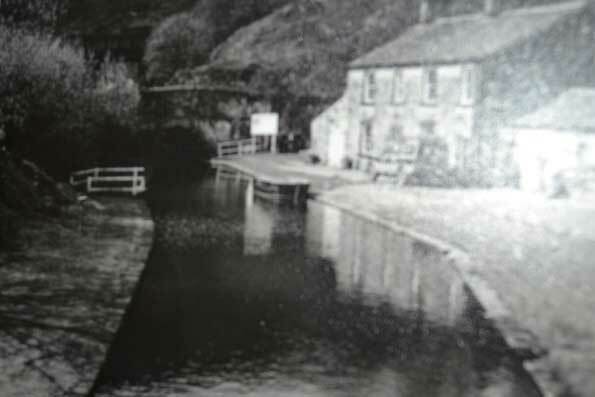 Work started on the Huddersfield Narrow canal at Asply in 1794 and by 1798 it had reached Marsden. They then came across several difficulties as a three mile tunnel through the hillside had to be constructed. Permission was needed to raise more money. This was secured and work continued and on 4th April 1811 it was finished. It is a single tunnel and the boats were propelled through the tunnel by ‘legging’. To do this two boatmen had to be on their back and move forward by pushing their feet against the tunnel roof. This is the longest, deepest highest tunnel in the UK. You can go for a trip into the tunnel. Tunnel End is well worth a visit. Ravensknowle House was built between 1859 and 1861. It has some very ornate stonework. 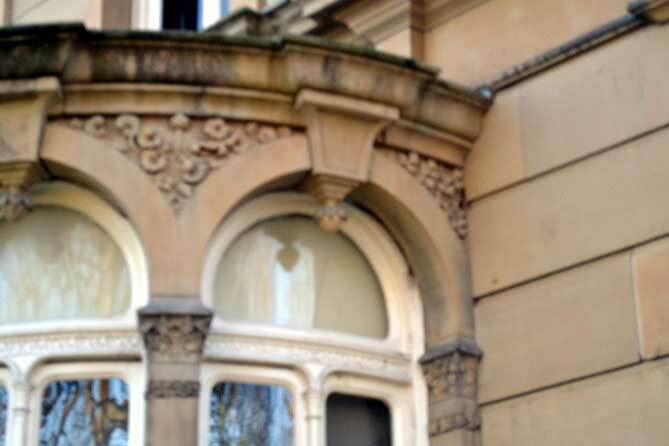 The stonework is particularly fine round the ‘arcaded’ bay window of the Morning Room. To construct these arcaded windows required great skill as the stones used not only had to have an upward curve but also come together as a semicircle. It is cotton and was made in 1819 to honour the victims of the Peterloo Massacre in Manchester. This banner had to be hidden between meetings. 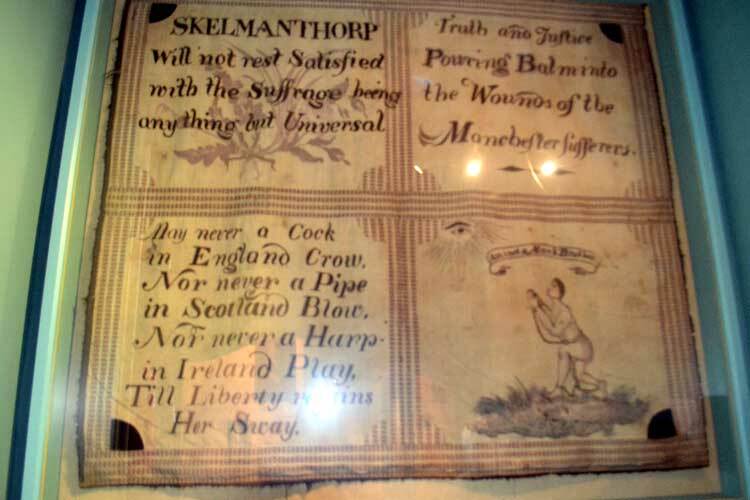 It is a rare survivor of thousands of banners that were carried at meetings calling for electoral reform and suffrage. It is one of the 10 treasures of Tolson Museum and it was chosen to be part of the ‘A History of the World’, a joint project between the British museum and the BBC. John Beaumont started out working in his father’s cloth manufacturing business in Dalton. He proved to be a gifted designer and worked developing design for other firms. He went into partnership with his brother-in-law in the manufacturing of fancy waistcoating. 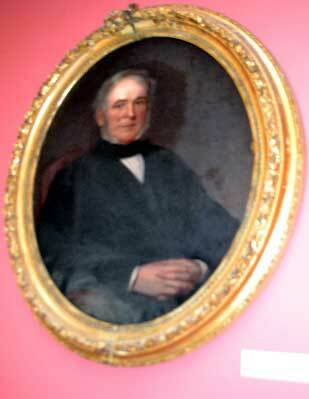 He made investments in Scottish Railways and was a director of the North British Railway Company. In 1850 he bought the Ravensknowle Estate and had Ravensknowle Hall, designed by Richard Tress, built between 1859 and 1861. He was a local magistrate. In 1845 the Huddersfield to Penistone Railway Line was started. This would join to the Manchester to Sheffield Line. It was an enormous challenge which needed the construction of 4 viaducts, 6 tunnels and 57 bridges. The line was opened in 1850. 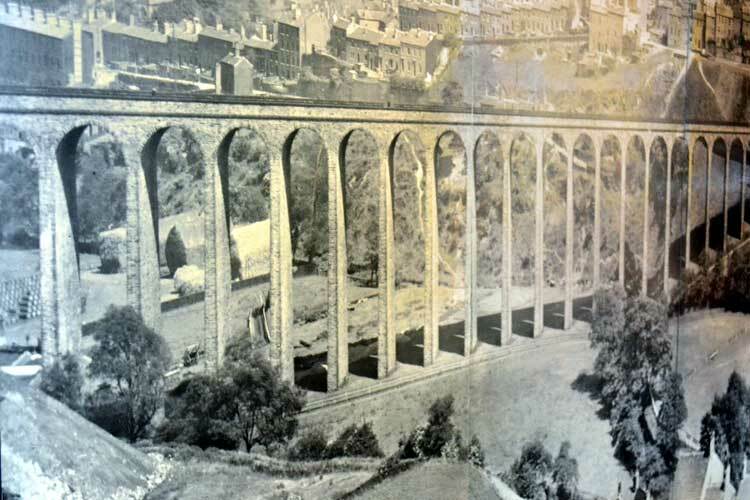 This is the Paddock Viaduct, the first of four stunning viaducts.